It was the best of times, and now it’s the worst of times. Thirty years ago, the world stood on the brink of the end of the Cold War and the demise of the only major global rival to the liberal democratic order, Soviet communism. At the time, some predicted the inevitable spread of liberal values, including freedom of speech. This was the first of the “Four Freedoms” promoted by President Franklin D. Roosevelt as the basis for the post-World War II international order, and enshrined as Article 19 in the Universal Declaration of Human Rights of the United Nations. Since the Enlightenment, it has been an axiom of liberal governance that people should not face the risk of death for expressing themselves in speech or in print, regardless of how objectionable their ideas might be. However, the Salman Rushdie Affair was a strong rebuke to the hope that freedom of expression would spread around the world, even in an era of liberal hegemony. Rushdie, an author and British national of Pakistani Muslim background, published his infamous novel, The Satanic Verses, in 1988. Although the book is mostly a fantasy story evoking themes of immigration, identity, and authenticity, the title of the book is taken from an extremely sensitive chapter in the life of Muhammad, the prophet of Islam. The book takes artistic license with this history in a subplot of the novel that many Muslims considered irreverent. Worldwide Muslim demonstrations against The Satanic Verses were severe, and the Supreme Leader of the Islamic Republic of Iran, the Ayatollah Khomeini, issued a fatwa – an Islamic religious ruling – calling on all Muslims to kill Rushdie. Of course, the fact that Rushdie’s book presented a very unflattering picture of Khomeini himself probably played no small role in the Ayatollah’s decision. The fatwa against Rushdie was remarkable, for it involved a head of state pronouncing an extrajudicial death sentence on a foreign national in another country for the crime of blasphemy. It was a complete violation of the most basic principles of the international order, especially the concepts of state sovereignty over domestic affairs, political dissent, and the free expression of that dissent through satire. However, as the self-proclaimed representative of God on earth, the Ayatollah Khomeini believed himself to be above any man-made rules of international governance. The nature of Khashoggi’s murder has garnered significant media attention. Not only has it emerged that he was lured into the Saudi consulate under false guarantees for his safety, in order to complete paperwork related to his impending marriage to his Turkish fiancé, but evidence suggests that the Saudi hit team that carried out the murder was extremely gruesome in going about it. Evidence that this was a deliberate assassination, not a botched kidnapping as the Saudis have averred (kidnappers usually don’t bring bone saws on their mission), and that it took place on the personal orders of the crown prince, is overwhelming. The CIA has reported as much. The Saudi ambassador to the United States, Khalid bin Salman, is the crown prince’s brother. 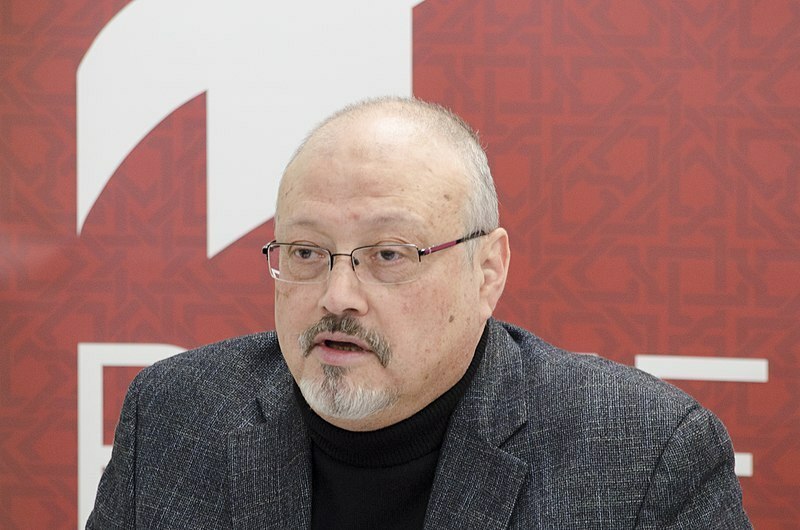 He directed Khashoggi to go to the Saudi consulate in Istanbul, giving him reassurances that he would not be harmed while he picked up his papers. Just prior this exchange, the CIA claims that the crown prince had contacted the ambassador. The Saudi story has changed a dizzying number of times, with all versions possessing a constant thread: the crown prince had nothing to do with it. At the same time, Saudi authorities have suggested that it makes no sense either way. “As the custodian of the two mosques [Mecca and Medina],” the Saudi Foreign Minister has said, any talk of holding Muhammad bin Salman responsible for the Khashoggi is a “red line.” In other words, his divine right purportedly puts the crown prince above the law of the civilized world. This is eerily reminiscent of the attitude of Khomeini during the Rushdie Affair. Some have attempted to downplay the murder by noting that Khashoggi apparently had ties to the Muslim Brotherhood and was a one-time associate of Osama bin Laden. But that’s irrelevant. The Saudi royal family and the Muslim Brotherhood both drink from the same well of Salafi Islam. Both want theocracy. The only difference between the two is that the former thinks its has the prerogative of ruling that theocracy; the latter wants a theocracy voted in at the ballot box. The issue in this case is not the moral character of Khashoggi, but the moral fortitude of the international order. Quite simply, the world cannot tolerate mafia states and their thuggish behaviour on the world stage, no matter whom they victimize. U.S. President Donald Trump has been criticized for his apathetic reaction to the Khashoggi murder, especially his ill-advised suggestion that morality takes a back seat to American business interests. Many voices, including those within his party, have called for stronger punitive action, especially against the crown prince. However, Trump’s circumspection is not entirely without warrant, especially for a presidency that has been marred with a reckless foreign policy that is shaking up alliances. Saudi Arabia is, after all, a bulwark against Iran, a de factopartner of Israel, and a major supplier of world energy resources, and Trump would be remiss if he rushed headlong into jeopardizing its relationship with the United States. The Middle East is destabilized enough without having to be undermined any further. The United States does have some leverage. The armaments that the United States is offering the Saudis, who are in the middle of a massive military build-up, cannot be replaced by Russian or Chinese equivalents. The record low oil prices, which are driving down the American stock market, are probably the result of a worldwide glut in production and weaker energy demands from a slowing global economy, not personal deal making between Trump and Muhammed. The idea that some kind of row will disrupt U.S. energy markets is probably unfounded. However, given the nexus between Saudi Arabia as a “friendly” Arab state, Israel’s security needs, and the United States’ role as a guarantor of Israel’s security, the United States cannot tolerate an all-out rift with the Saudis, which might occur if severe punitive action is taken against Muhammed bin Salman. The solution is that the punishment of Saudi Arabia cannot be left to the United States to mete out alone. A broad, multilateral effort should be made to protest Saudi Arabia’s gross violation of human rights in the Khashoggi case and to make it feel the punishing consequences of doing so. NATO countries should take the lead on this. By mounting collective pressure on the Kingdom, a level of pushback against Saudi Arabia’s rogue behaviour can be achieved without severely harming the U.S.-Saudi relationship by expanding it from a bilateral to a much more multilateral affair. Turkey, a NATO member and a county embarrassed by the Khashoggi incident, has already called for stronger action against Saudi Arabia, although the world needs to be cautious that Turkey might exploit this incident as an opportunity to challenge its main Middle Eastern rival. Germany and Denmark, also NATO allies, along with Finland, have decided to punish Saudi Arabia by cancelling their arms deals with the Kingdom. This could spread to become a wider European Union posture. It’s also time for the United Nations to get serious about the values enshrined in its Universal Declaration. Saudi Arabia’s actions have made a mockery of that document and that country’s seat on the UN Human Rights Council. The UN has undertaken investigations into high-profile killings before, such as the inquiry into the assassination of Benazir Bhutto in 2009. A stronger intergovernmental response will lend more legitimacy to the cause of standing up for human rights and the rules-based international order, while disciplining Saudi Arabia, all the while sparing the U.S.-Saudi relationship irreparable harm. It has been thirty years since the Rushdie Affair, and the international status of free speech and its vulnerability to extraterritorial killing seems to be in worse shape now than it was then. It seems that every autocratic regime around the world is becoming more brazen in silencing critics abroad. Russia has been accused of attempting to poison a former Russian agent resident in Britain, Sergei Skirpal, in March 2018. The operation failed, and the head of Russia’s GRU, the military intelligence service implicated in the attack, recently died under suspicious circumstances. China recently “disappeared” the president of Interpol, Meng Hongwei, after he visited from Lyon. This behaviour will continue unless a line is drawn in the sand. Image: Jamal Khashoggi delivers remarks about Muhammed bin Salman’s rulership in Saudi Arabia during a conference organized by the Project on Middle East Democracy (POMED) by April Brady via Wikipedia Commons (CC BY 2.0).